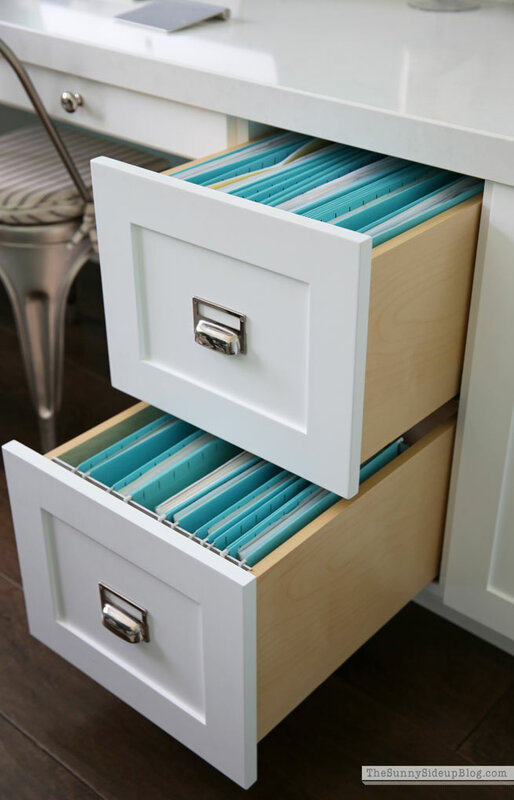 Last week I decided to pull some file folders out of my office drawers to sort through. 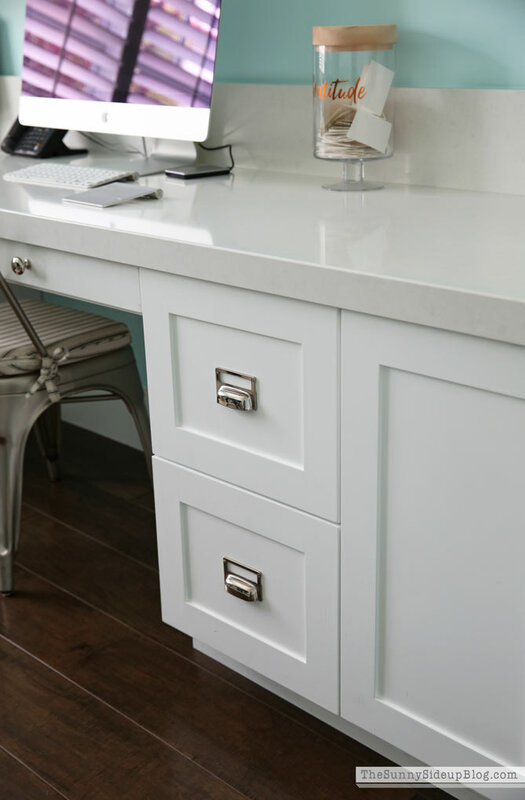 The drawers had been driving me crazy for months because they were getting overstuffed with paper I knew I didn’t need to hang on to anymore. I decided that since I was going to sort through my office files, I might as well sort through some old files in our filing cabinet in the garage. 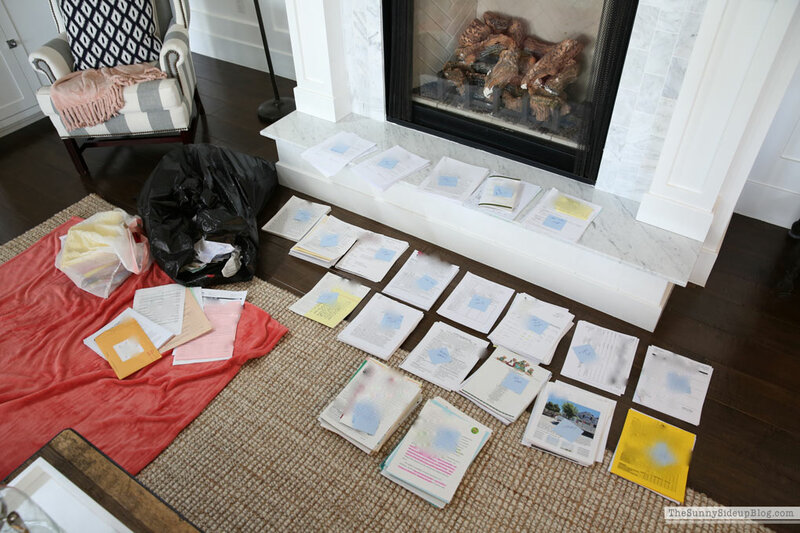 And since I was doing that, why not go through the files sitting in a pile in my husband’s office too? All of the sudden I was staring at this ENORMOUS pile of paper on my family room floor wondering two things. 1) How in the world did we let our paper consumption get so out of control!? And 2) Why in the world did I just turn a 20 minute project into a 4 hour project!? But I was determined to organize my paper files once and for all so I sat on the floor and got to work! Two Hallmark ‘Christmas in July’ movies later my family room floor looked like this. One very large sack of paper to recycle, a pile of paper that needed to be shredded, a pile of paper I needed to ask my husband about, and my categorized paper piles. 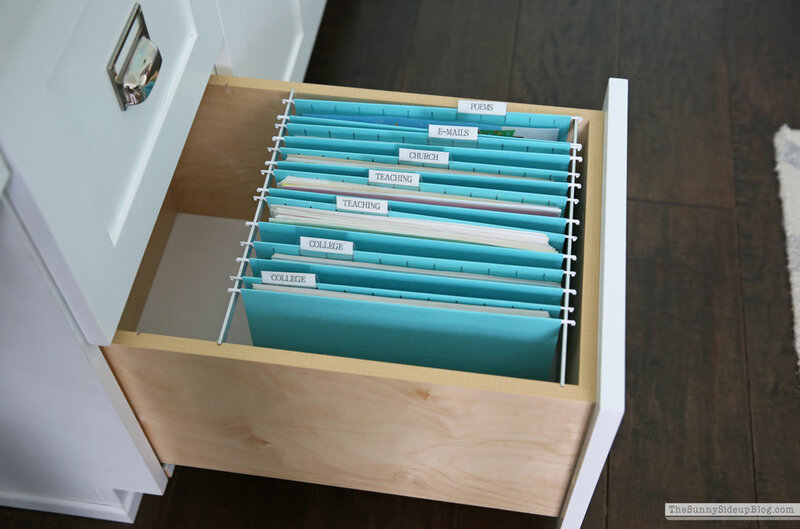 For me this has always been the easiest way to organize paper. Dump everything on the floor. 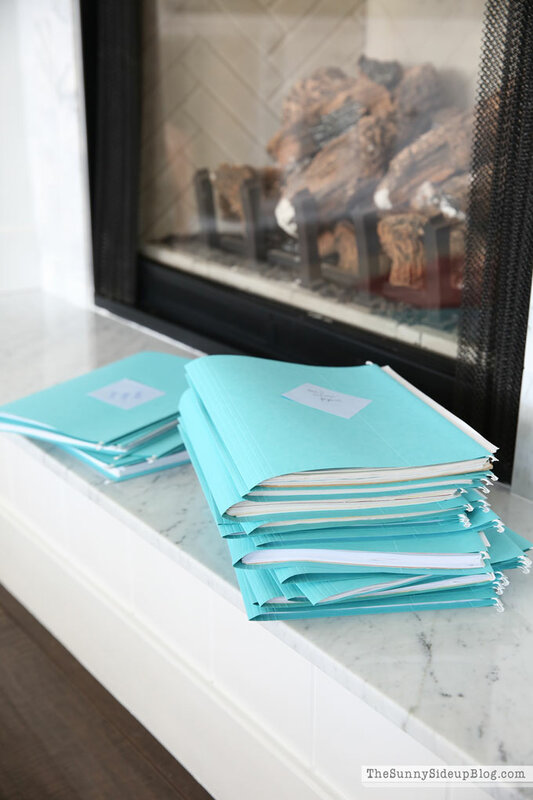 Pick up each paper and decide if you can recycle it or if it needs to be filed. 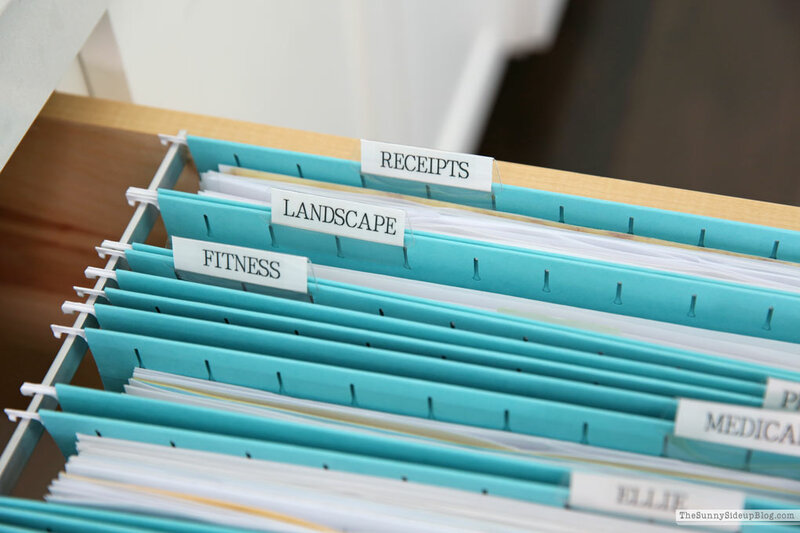 If you are going to file it, decide what category it fits in, write that down on a sticky note and add to it as you go. I never know what my folders will be named until I’ve made my sticky note piles and figure out what paper can be combined in a folder. 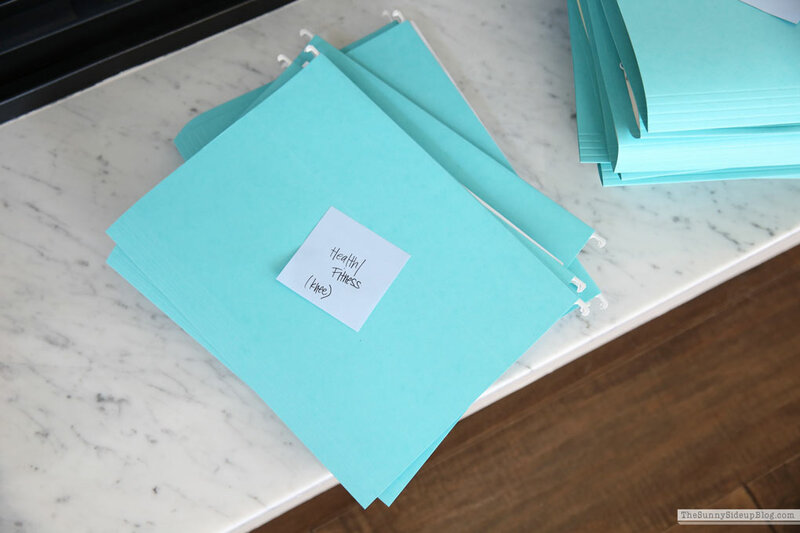 I had some Smead hanging file folders on hand so I chose some blue folders (worked best with my office decor!) and got to work labeling. I only kept things that are current and that I refer to often. Be ruthless when you are purging paper! Or anything else for that matter. The drawers on both sides of my computer look like this closed.. 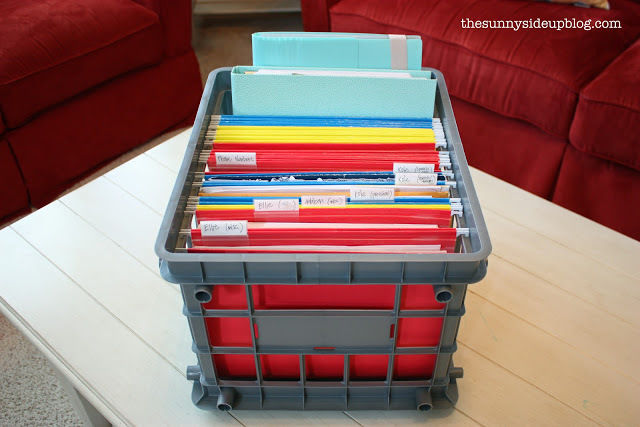 Organized paper files! Wait for it.. do you hear!? The angels are singing again. I used my trusty label maker and kept things simple. Just folders that hold important info. I refer to often. I was able to recycle a lot of things I kept from when my girls were younger so for now my little buddy is monopolizing most of the drawer. 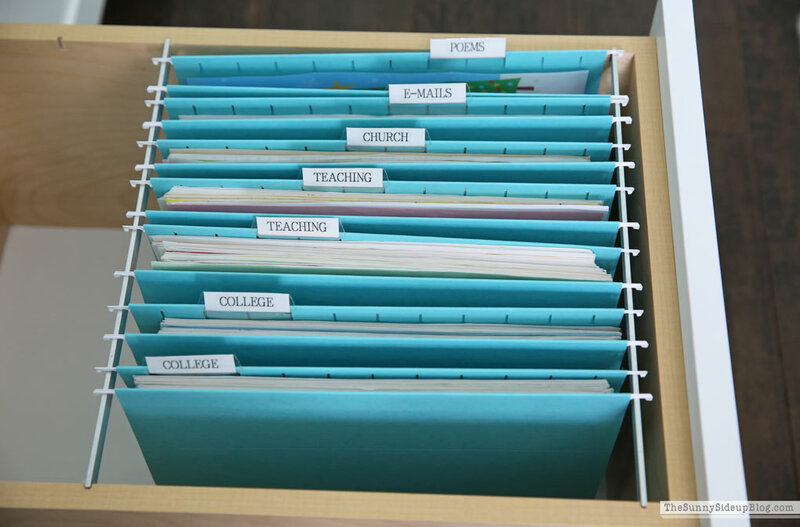 ;) After the kids’ individual folders I just kept things I refer to often like family medical forms (immunization cards), class phone directories.. 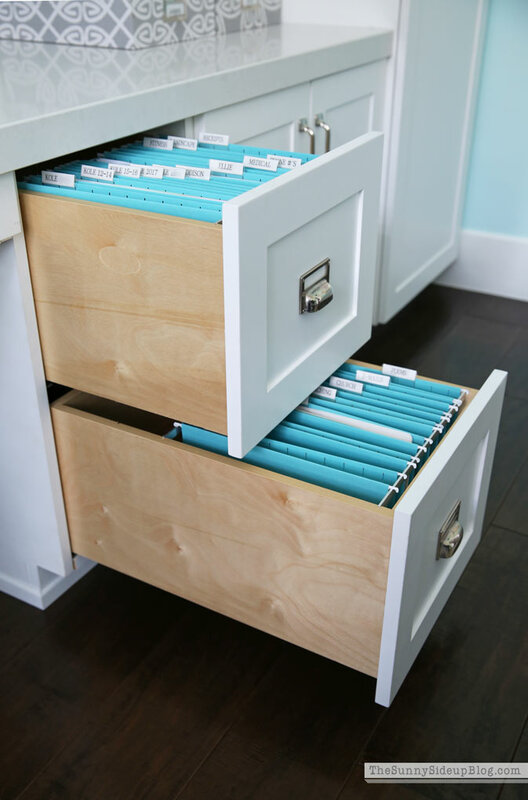 I had my cabinet guy make these built-in file drawers for my offie and I’ve loved them. They work great if you’re short on office space! The bottom drawer holds forms I want to keep but don’t look at often. Transcripts and important papers from college, some stuff from my teaching years, church talks I want to hang on to, some special e-mails I’ve printed and saved and the poems my husband’s grandma wrote us for Christmas every year (love seeing her handwriting). Other forms we keep (taxes, finances, etc.) my husband has in his office and I still need to go through those. But that requires his help so tackling that little project is a horse of a different color. Ha. Then I have the kids’ school boxes I’m finishing and some keepsakes in a different cupboard so as soon as I wrap up our paper organization I’ll do a huge post that includes how I’m organizing ALL the paper in this house. 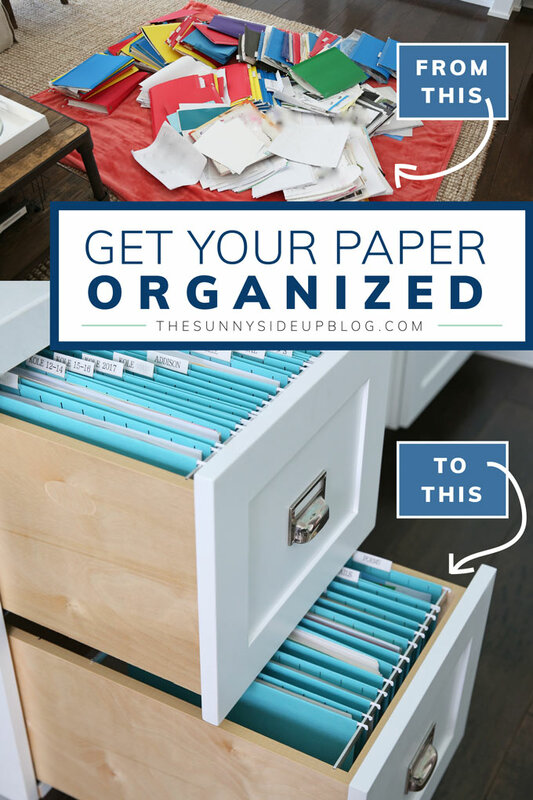 So if you have drawers stuffed full of paper like I did, here is your invitation to set aside a few hours as soon as possible and JUST DO IT! Turn on your favorite movie (or Hallmark Christmas in July because it’s on and why not?) and start a recycle pile. Then the angels can come and sing at your house too. I’ll loan them to you! Great post, Erin! I just might have to take you up on your suggestion. 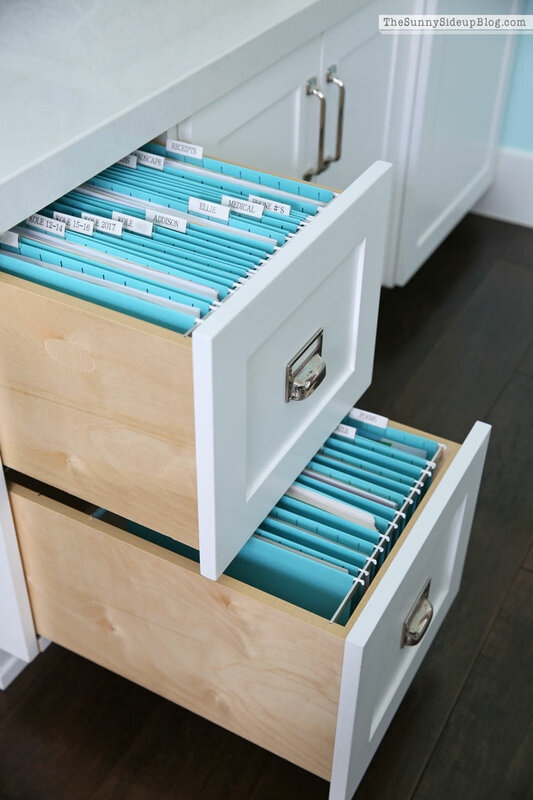 I’ve a file cabinet that is stuffed to the gills.You didn’t mention it, and maybe they are more in your husband’s files, but do you have separate storage for items that you can take out of active files and put into deep storage. Like the files that need to be kept for X number of years for tax purposes. Just curious. 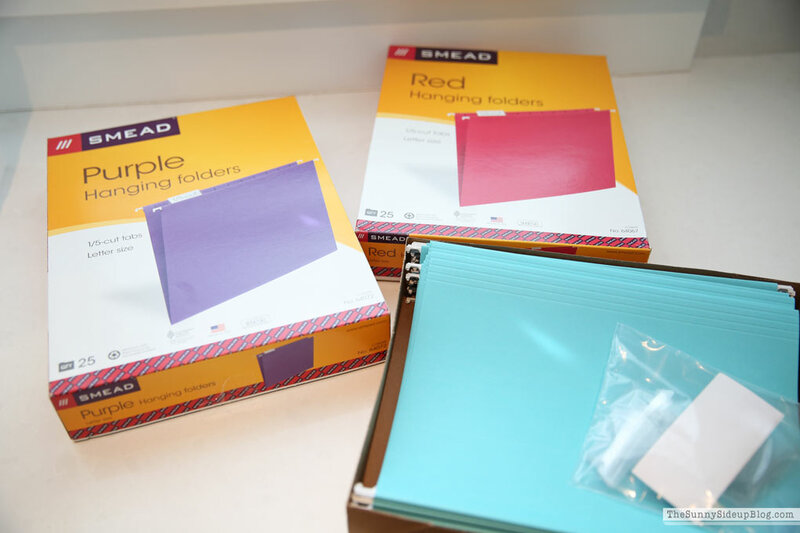 I love how you have on hand a box of red, purple and blue file folders.. 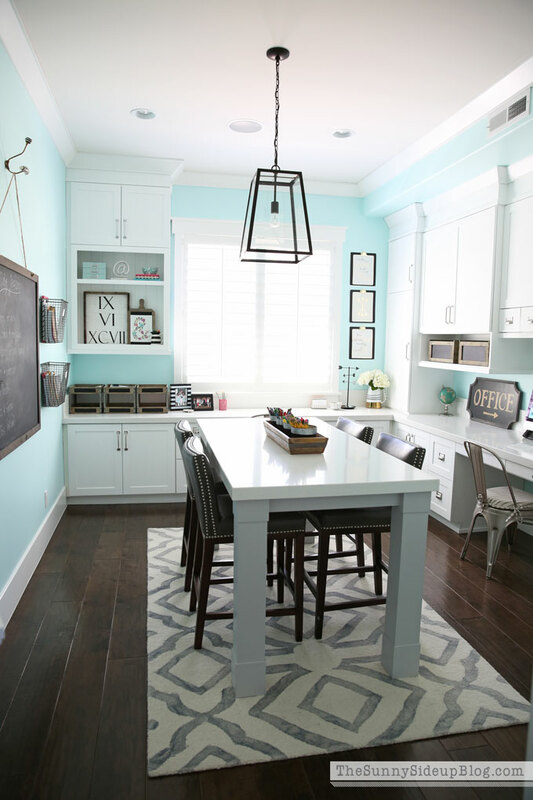 Pretty colors make the job a bit less daunting, too, right? Thanks so much for sharing and happy for you to have that filing issue off your list of to dos. Have a great day! Looks great Erin! When we moved this last winter I got rid of a LOT of our paper., probably most of it. And now I’ve been spending days at work cleaning out a former coworker’s area. It all definitely makes me realize how much waste we create (paper, plastic, etc) and I’m hoping to do better. Recyling is good but not collecting it all in the first place is best :) Thanks for the great organizing post and the motivation! “but when we just START”….Isn’t that the HARDEST part! I finally tackled mine last month. I have a bad back so I pulled out a long folding table and got to work. Same idea…piles, piles and more piles. Feels SO good! When I put the tabs in I skip every other one. I insert them in odd numbered slots (1,3,5…) so the entire tab is visible. I love organizing posts like this! Thanks for sharing! Hi Erin! I appreciate this post. You’ve motivated me to do this in the next few weeks before school starts. 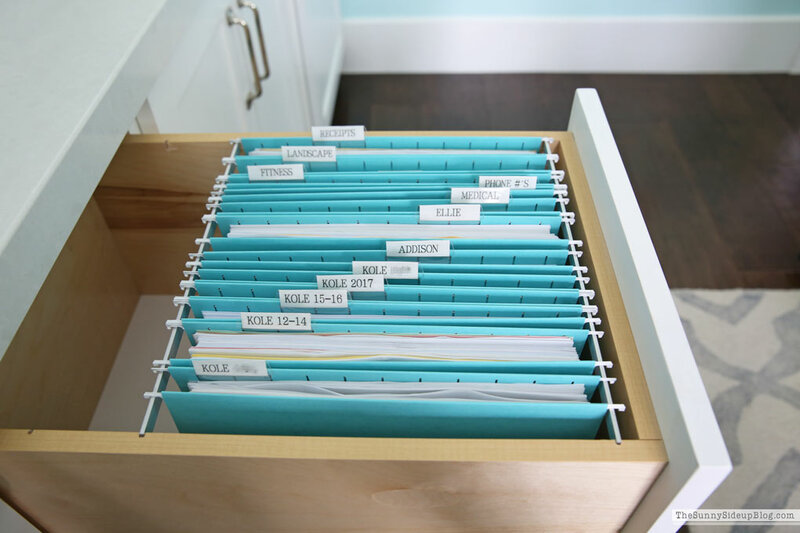 I am wondering how you organize keepsake type paper, like cards and letters you want to save. I have 5 kids and for my first I saved WAY too much of that stuff and now he’s grown and asking me why I saved so much junk lol. So I don’t want to do that again but I do want to save some. It’s starting to overflow the boxes I currently have so I’m looking for a new system or maybe I just need to purge. 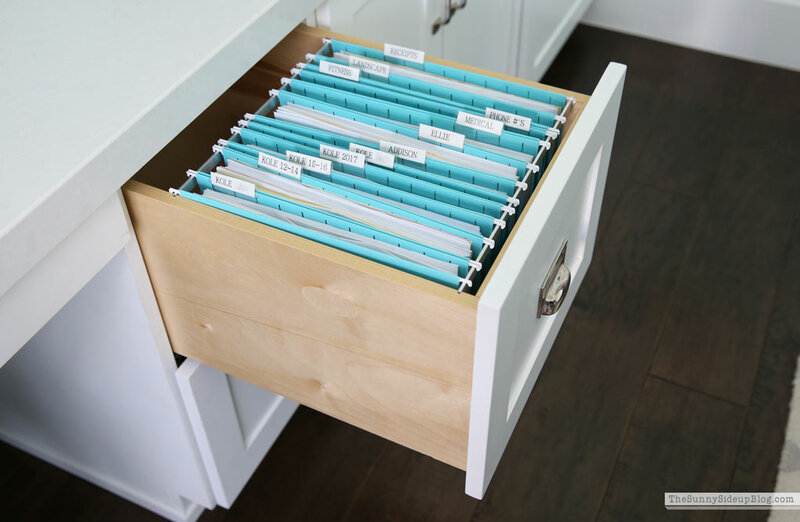 Thank you for the post – I have many files that I keep because I’ve always kept them… need to pull them all out and sort ruthlessly! Question: What are the kids’ school boxes and keepsakes? 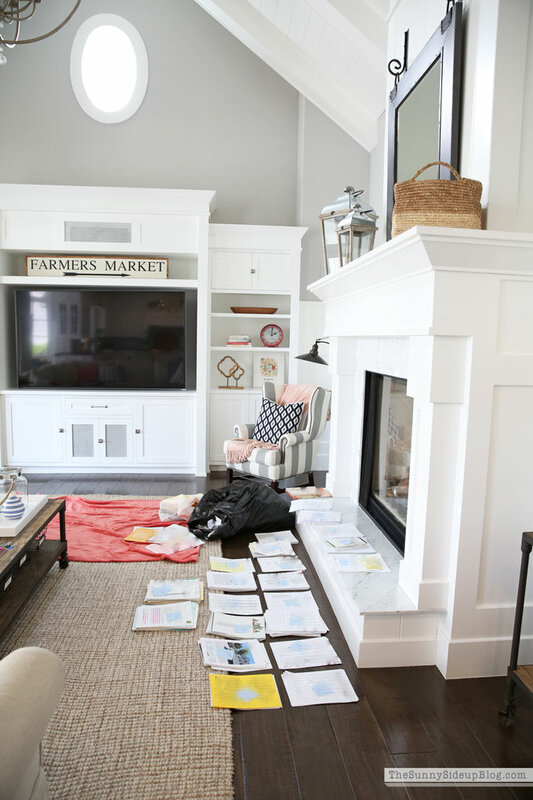 Can you share how you sort/purge/keep and organize those items? Desperately need help with that area of paperwork! :). Thank you!!! I’ve been putting this same project off but it’s moved up the list! I believe I’ll tackle it and find somewhere local that shreds paper. Thanks for the motivation! Me too Cassie! It’s the BEST feeling! Thank you! I knew this process wasn’t rocket science but I’m the same way.. seeing other people do it motivates me to do it too! Great post Erin. I constantly feel overwhelmed with everything these days but I think the paperwork that enters the house is the worst. Good on you for getting stuck into it. Well done. I need to go through all the papers. I have a closet in my office that I just throw papers to get them out of sight, so I desperately need to go through those and all the file cabinets. One of my biggest challenges though is what to do with ALL the artwork my kids bring home (daughter 4, son 6). I feel bad throwing it in the trash right away, so again, I throw it in the playroom closet until the pile gets so big that I dump it in a garbage bag! My plan is to go through it and keep a few pieces, but that hasn’t happened yet. Hi, I was wondering what are the dimensions of your office? Thanks!